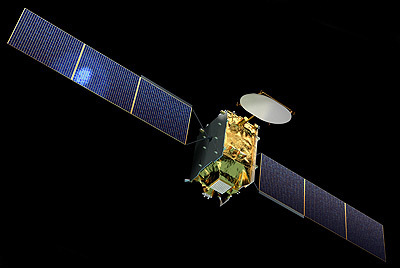 Eutelsat Quantum is an experimental communications satellite with a software reconfigurable payload It is developed jointly by ESA, Eutelsat and Airbus Defence and Space. SSTL will provide the bus based on the GMP-TL Bus platform. The spacecraft will use conventional thruster propulsion. The reconfigurable all Ku-band communications payload will use 5 kW of power. The phased array antenna is being provided by Airbus’s Spanish CASA division. Quantum is a public–private partnership (PPP) between ESA, leading satellite operator Eutelsat and Airbus Defence & Space (UK). The partnership ensures the three parties share risks and funds. The first Quantum satellite will be delivered in 2018 and operated by Eutelsat to serve government, mobility and data markets. Airbus DS will be the prime contractor, using a new platform from Surrey Satellite Technology Limited (SSTL). Both developments are supported by the UK Space Agency. Eutelsat-Quantum - 2020 Ko ELA-3 Ariane-5ECA with ?